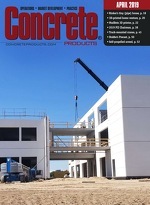 Concrete Products - Editor, Don Marsh, Writes About the Concrete Industry. As Editor of Concrete Products for the past 20 years, Don Marsh has his thumb on the pulse of the concrete industry. Concrete Products covers the issues that attract producers of ready mixed and manufactured concrete. With an editorial focus on equipment and material technology, market development and management topics, Concrete Products provides practical information for management professionals on how to run their day to day business.